Jobs for flight attendants are competitive. One way to stand out from the crowd is to write a strong cover letter that emphasizes your unique skills and abilities. Review an example of a cover letter for a flight attendant job, and then personalize it to reflect your qualifications for the job. Also see below for a list of in-demand flight attendant skills you can incorporate into your cover letter, resume and interview. Make sure to write a unique cover letter for each job you apply for. Every airline is different, and each one has different requirements and company culture. Your resume will stand out if you take the time to individualize each letter. In the body of your letter, emphasize the skills you possess that make you a strong flight attendant. Use the list of flight attendant skills (see below) as well as the job listing, to get a sense of what skills you should highlight in your letter. When stating in your cover letter that you have certain skills, include specific examples of times you have demonstrated those skills. If you have never been a flight attendant, you can draw on other work, volunteer, or school experiences to show your skills. For example, you can demonstrate your customer service skills with an example from a job at a clothing store. Be sure to edit your cover letter for spelling and grammar errors thoroughly. 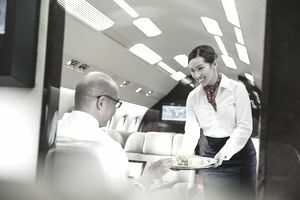 Flight attendant jobs are very competitive, and even a small spelling error can hurt your chances of getting an interview. One way to stand out from the applicant pool is to follow up with the employer a week or two after sending your cover letter. However, do not do this if the job listing specifically asks you not to contact them. This is an example of a flight attendant cover letter. Download the flight attendant cover letter template (compatible with Google Docs and Word Online) or see below for more examples. Of course, required skills will vary based on the position for which you're applying, so be sure to look closely at the job listing for a sense of the most important skills. Also, review our list of skills listed by job and type of skill. Communication is extremely important for a flight attendant. You have to clearly, calmly, and kindly communicate important information to passengers, and listen to their questions and concerns. Customer service is perhaps the most important skill for a flight attendant. Your main job is to work with customers face-to-face, helping answer their questions, make them comfortable, and serve them. You should be able to engage with people (even those who are angry or frustrated) with a calm, positive energy. Flight attendants need to be strong leaders. They have to step up and take control of a variety of situations, ranging from safety issues to difficulties with passengers. Airlines want flight attendants who have the physical stamina for the job. You have to be on your feet for long periods of time. You also have to lift and carry luggage, reach for items, and pushcarts of food and drinks. While leadership is important for flight attendants, they also have to be team players. As a flight attendant, you are part of a cabin crew. You have to be able to work well with the crew, even when you are in tight quarters or a stressful situation.